G&L is a company with rich ties to tradition. Founded by none other than George Fullerton and Leo Fender, G&L has started their own tradition by creating updated, modern interpretations of classic designs. This closely follows founder Leo Fender’s ethic of continuing improvement and refinement, never resting on laurels, and always striving to find a better way to do things. While many players today are familiar with G&L and their more popular models, like the Legacy and iconic ASAT, what some may not be aware of is G&L’s Custom Creations Department, established in 1998 as a creative outlet for the company’s craftsmen to produce runs of special instruments. Premier Guitar recently had the opportunity to sit down with Dayv Chavez, Product Manager for G&L, for a talk about the Custom Creations Department, a bit about G&L’s history, and a few hints at what is in store. How did the Custom Creations Department get started? The department was built with the idea of creating Limited Edition instruments with options that aren’t available on any of our other guitars. G&L has many talented and creative musicians, and there have always been animated discussions between them about how they’d like to customize a G&L. Sometimes the ideas are purely functional and tonal, and sometimes they involve a major cosmetic departure. We realized it would be fun and rewarding to enable our people to realize their dream G&Ls. Some CCD designs we build in one run and leave them be; with others we choose to leave the door open for a future run. With the Limited Edition instruments, we do runs of them from time to time; we’ll do 100 at a time, and maybe a year later we’ll do another 100, maybe in a different fashion, not necessarily the same way. With the Special Build instruments, our builders are given the freedom to take the time to develop something that is a little more off the cuff than what we normally do. So the CCD doesn’t really have a custom shop aspect where someone could call and request one to be made? No, and the reason for that is that we pretty much are a semi-custom shop – there’s a list of options where any of our dealers can call up and say, “I want this build, with this kind of neck, this kind of wood, and this kind of finish,” at no extra charge. Have you ever had an order that came through that helped spawn an idea for a Special Build or Limited Edition? There are so many orders that have had some influence on the CCD that it wouldn’t be fair to try to pick just one. However, one that comes to mind is our ASAT Classic BluesBoy. That actually came about by a dealer who requested that we build an ASAT with a humbucker, kind of in a Keith Richards style. It turned out to be such a success and many dealers started asking for it, so we ended up adding it to our normal roster. Customers may also trigger some train of thought which germinates into a vision. Take our ASAT Special with the big Magnetic Field Design pickups. People new to the G&L scene have described this guitar as the “one with the P-90 pickups,” but despite a similar appearance, they’re not the same design. One of our guys thought it would be cool to build an ASAT Special with Gibson-esqe cues just to play on the visual similarity the big MFD pickups share with P-90s. The idea was an instant hit with our crew, so with some tinkering and chambering the body, our ASAT Junior was born. The Special Build guitars kind of seem like a free-for-all. What is the process in developing these? The development process is the same for both Limited Edition and Special Build models. The difference is that at the beginning of the process, the CCD has to make a judgment as to whether a concept will be strictly limited or open for another run sometime in the future. The ASAT Junior was really special to us but it just felt right to go Limited Edition. Other concepts, like our ASAT Classic S, seem to us like we should keep the door open. It’s ubjective, but once the decision is made we stick by it. Who determines how many pieces are going to be in any given run? The Custom Creations Department does, and they prefer to keep the quantity low, usually 100 pieces or less. If it’s something that deserves a larger number, such as our 25th Anniversary model, of which we made 250, we stretch out the production of the model so that we don’t jack up the lead time on our custom orders. The idea is to keep the run short and still have a sense of excitement about it, and then right away get the neurons firing over the next cool instrument. Can people get the Custom Creations Department guitars straight from G&L, or do they have to go through the dealers? Everything is done through our dealers. Customers can feel more than happy to give us a call if they want to figure out how to configure their instrument, as a lot of people have questions about things like tonal nuances. They can then go back to the dealer and definitively say, “this is what I want.” We recommend that everybody get acquainted with a dealer. We take pride in the quality of our dealers, and they’re capable of fielding just about any question about custom orders. Are the people that work in the Custom Creations Department the same people working in the regular build department? All of the instruments are built in the same factory, and everyone in the factory shares all the work as it comes through. If it comes from the Custom Creations Department, there’s not just one guy in particular that works on them specifically, because everybody that we have there is a complete craftsman, 100%. However, normally there is one person there who will take the lead in the outcome of that instrument. They’ll be somebody who’s more specialized in the area and will father the instrument from concept to fruition. This makes it even more fulfilling for the CCD crew, because if it’s your baby and you’ve championed it, you’re going to want to be sure it comes out just as you’d imagined. Do you see the CCD instruments as guitars mainly for playing, or are they more of a collector’s item? I think it’s both, I mean these instruments really have a special quality to them, and a lot of people will say to us that they wish they had two because they like to play the thing so much. So I think it’s both at the same time – they end up playing them, but they also end up taking very good care of them. You mentioned breaking out of the mold a little bit. Is G&L getting away from more of the traditional stuff? For instance, can we look forward to some more non-traditional shapes, along the lines of the Interceptor, in the future? It’s interesting that you bring that up, because this year in particular that’s kind of the route that we’re taking. We feel the time is right to start bringing back some of Leo’s earlier G&L shapes and designs, but improved as he would expect. Without going into specific details – we want people to be excited when they see them – we do have a couple of instruments that will be launched this year which are modern versions of some of the early instruments G&L made – for example, the F-100, G&L’s first model, and possibly the SC-2. You’re going to see modernized versions of these instruments; we’re bringing them into the present. We also have a Comanche 6 Studio coming, based on Leo’s first rendition of the Comanche, which has the split coil pickups and six switches. Three switches turn the pickups on and off, while the other three turn separate coils on and off on the individual pickups. It gets pretty interesting with all of the different pickup combinations you can coax out of that. You guys have quite the legacy with Leo Fender and George Fullerton; how big is your responsibility to that legacy when you’re coming up with new designs for the CCD? We did a photo shoot with Phyllis Fender recently, and I asked Phyllis if she had some of the instruments that Leo kept around from the golden era. She said that he never saved anything, and he would say that he didn’t keep any of those instruments because every instrument that he would make after was always going to be better, so why have an inferior instrument? At G&L, our goal is to always raise the bar, making ever better instruments, advancing the technology in the instruments and production, and in a broader sense, bring musicians the finest instruments available. This is the mantra that we’ve adopted from Leo. 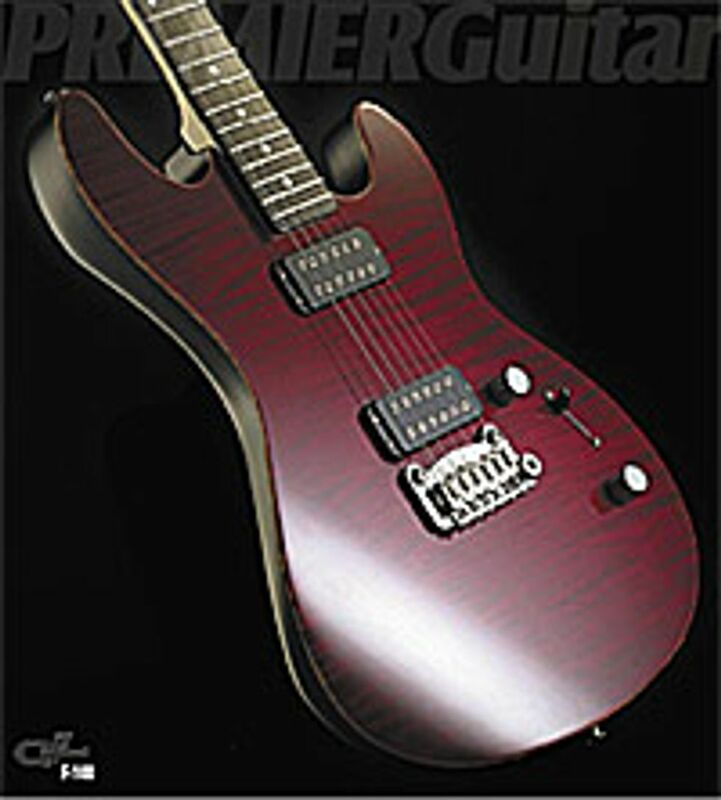 Leo said that “G&L instruments are the finest I have ever made,” and our idea is to continue on with that same spirit. I must admit it did take a while to grapple with the powerful legacy we had to manage. Fortunately, George has been very helpful as a mentor for us for the physical and functional aspects of the instruments, while Phyllis has been a philosophical mentor, keeping us grounded. But do you ever feel pressure to stay with more traditional shapes because of where your company has come from? In terms of tradition, the shapes of our Legacy and our ASAT are definitely staples of Leo’s. What is exciting for us is the way time has changed the perception of G&L’s earlier designs, such as the F-100, G-200, SC series and others. Fifteen years ago, our customers had virtually no interest in those shapes; they wanted traditional shapes from G&L. Now our customers are showing more interest in the earlier shapes, and we’re thrilled that we can bring back the roots of the line. These are good times for us.